In a technological context, drones are unmanned small aircraft. They are formally tagged and known as unmanned aerial vehicles (UAVs) or unmanned aircraft systems (UASes). These miniature aircraft may be remotely controlled or can fly autonomously through software-controlled flight plans. This can be embedded in their systems, working in conjunction with onboard sensors, cameras, and GPS. But here, we will be most likely talking about the remote controlled ones. In this post, we will particularly take a spin on mini drones and all other important details about them. Mini drones are just basically drones, the usual drone features jam-packed into a smaller aircraft. A mini drone is about the size of your hand and they may be very little, but can surely offer vast of fun indoors and outdoors as well. An outline of the best mini drones will be featured in this article too. The group of smallest drones available is further divided into two subgroups and two size classifications. It includes the nano and mini drones. Nano drones are the smallest and usually have dimensions that are a bit larger than an insect. On the other hand, mini drones are a bit larger than the nano drones. They can reach up to almost 20 inches in length and have more powerful electric motors and better features than the nano drones. Nano drones are generally recommended for indoor flights. While the micro quadcopters or the mini drones can be flown both indoors and outdoors. Most nano and micro drones are designed for beginners who want to gain the necessary skills required in flying advanced drones. The size and design of both nano and mini drones are indeed perfect for beginners or novice drone pilots who are still trying out their drone-flying skills. 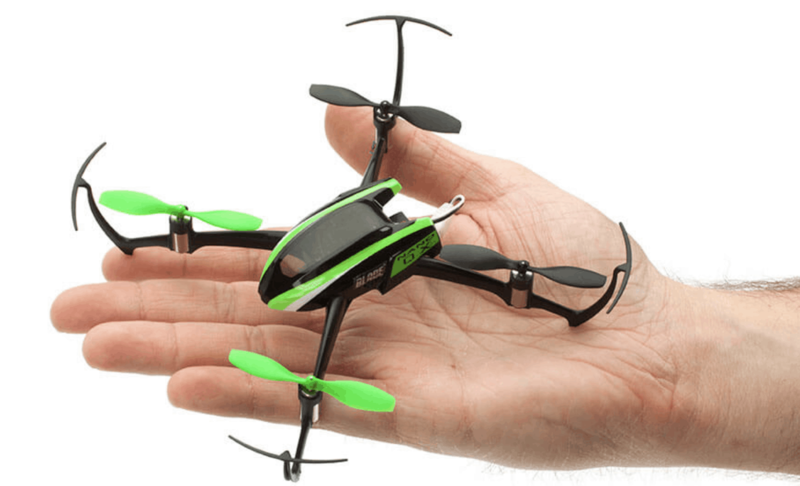 The smaller ones are easier to operate, affordable, portable, and safe to fly indoors and outdoors as well. Crashes are truly unavoidable especially when you are still practicing how to fly. But with the mini drones, there is nothing to worry about since they have less destructive crashes. Both types are great for your next adventure and trips. Also, these smaller models from both categories are used by the military during investigations and spying. This is because of the fact they can be easily maneuvered and used even in hard-to-reach locations with limited space. 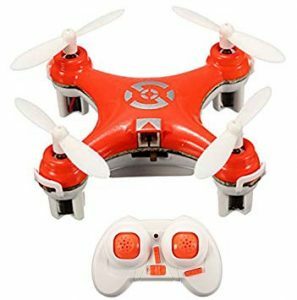 These mini drones are also perfect for kids and those who are still exploring the world of drones. Since the mini drones are very affordable and super easy to maneuver and work with. These mini flying vehicles, despite the size, are quite durable. They are super easy to carry around and can be flown just about anywhere. 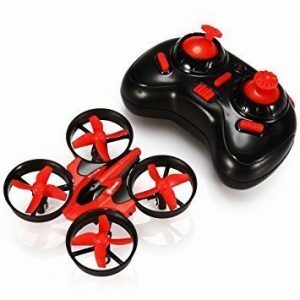 Many people love this mini drones because they can truly supply a lot of fun and enjoyment for young and adults alike. Similar to the above-mentioned, many would suggest that as a novice, you start with a mini drone. Then with some practice and after learning to master the controls of these tiny flying machines, you will be more confident about moving up to the larger ones. 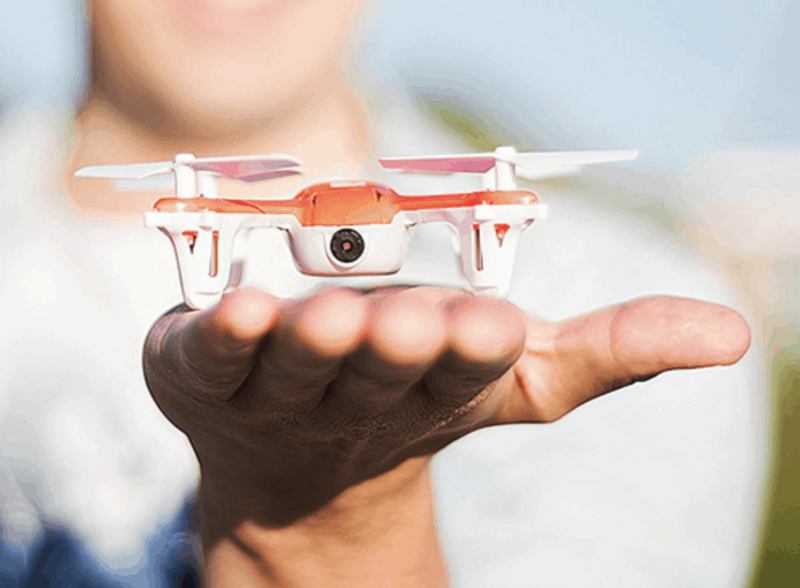 Mini drones are perhaps one of the most trending topics in the world of consumer electronics and gadgets. 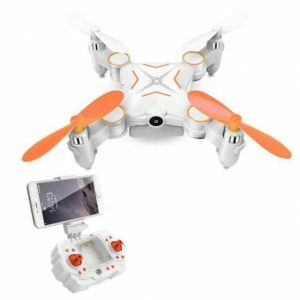 With all the different nano and mini quadcopters for sale, selecting the best mini drone to buy is not an easy task, especially if you are a beginner. But don’t worry since we are here to help make you decide on which mini or nano drone will be best for you. This Rabing Foldable mini drone is truly a compact, unique, and fun-looking drone which is available in the market today. Despite its miniature structure and design, it is jam-packed with techs and specs with a price that is just right. Most drone-users love its foldable design making it very portable and easy to carry and store. Another techy feature is that it features live FPV streaming with your smartphone. The unit comes with as a receptacle on the radio controller. If you like, you may use a smartphone or tablet to control the drone, although many users complain of slower transmission when using a smartphone app. The application also allows a split virtual reality mode so you will be able to enjoy real FPV. Regardless of its very affordable price, this drone comes with multiple features found in most high-quality models. 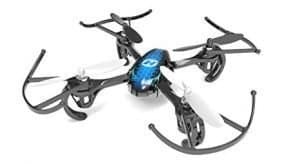 Some of these features include the 100-meter range, 8 minute flight time, 30 minutes charging time, and a sturdy construction that can withstand several bumps and crashes. Its lightweight is not ideal for flights during a super windy day. Syma has been known and has established a name in making great quality, but affordable drones that are toy-grade. With the Syma X20 mini pocket drone, you can get to enjoy a high-end drone quality at an affordable price. 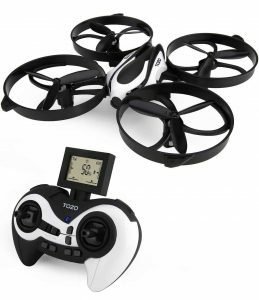 This X20 mini drone also boasts a headless mode function that will be very helpful for kids. One stand out feature of this is the single-touch takeoff and landing. For the newbie pilots, one of the most difficult things to master is taking off and landing, so this one can be of great help. If you are planning to own a Syma X20, you have to be extra careful since these drones can be fragile. So if you’re a bit clumsy, then this might not be the right mini drone for you. The X20 offers you about 5 minutes of flight time off a 50-minute charge. It has a built-in battery, and the cable that comes in the package is a fast-charging one. 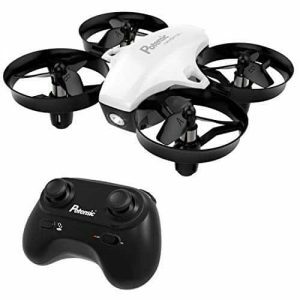 Despite its awesome features, it is totally cheap that is why many people love this mini drone. 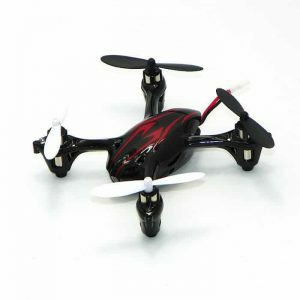 The HS170 Predator mini drone by Holy Stone is another model that most hobbyists love. Other than having great features, the HS170 is also a sight to behold. Although this is a mini drone, most experienced drone flyers suggest RC drone pilots to handle the HS170. 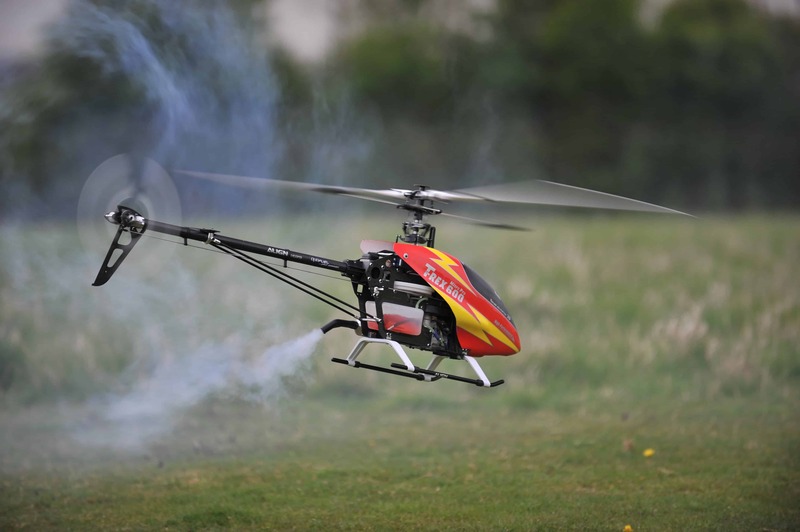 This is also a great choice for the RC helicopter trainers. This is a wind-resistant unit so it is totally great for flying even outdoors during windy conditions. It has an embedded headless security system that works well to avoid losing the drone. Its good performance and structure make it a stable and versatile drone. The Holy Stone HS170 Predator is durable, weather resistant, and aerodynamic. It is also shockproof, so even the most crash-prone beginner should be fine flying it. The HS170 is super light and excels when it comes to stability. Additionally, the package also comes with a 4G remote controller, four extra rotating blades, Li-Ion battery, a screwdriver, charging cable, and an instructions manual. When it comes to product specifications, it features 2.4GHz technology and 6-axis stabilization system. These awesome features make this helicopter very stable, easy to maneuver, and of good quality. This legendary Hubsan X4 is very known for its above-average power level. It comes with tiny motors which offers a surprising level of acceleration and speed. The Hubsan X4 is also famous for being the best mini drone to use for learning your flying skills. This drone is also friendly enough so that the users will not have a hard time in improving their pilot skill levels. The X4 This particular model comes with a camera, although you need to purchase an SD card for it. Its camera comes with a 0.3 MP video recording module and night vision. It also comes fitted with a 6-axis flight control system that gives you more control of how the drone flies. The Hubsan X4 has a flight time of 8 to 10 minutes and a charging time of 30 to 60 minutes. The controller has a standard range of 90 meters. For added fun, the drone can flip or roll at 360° for an amusing flight. Another feature is that when the power is low (about 2.8V), the drone will automatically return to you. This mini drone tops when it comes to appearance, design, and style. It’s got a body designed with a tiny mock cockpit, showing off an aesthetics of a modern and high technology sports car that flies. Another great news is the remote of this unit is pretty impressive in terms of ergonomics and is also notably pocketable. In the EACHINE E010, you’ll notice some shoulder buttons on this unit. The left button changes speed settings between high and low. The one on the right side, on the other hand, is the auto flip. This is indeed an incredible tiny drone for a good price range, it also boasts headless setting and one-key return. The EACHINE E010 mini drone is indeed a great beginner drone. It is perfect for flying indoors or just buzzing around in the house. The propeller ducts on this quadcopter make it super sturdy and durable, allowing you to bounce off walls and keep on moving. This little flyer will let you enjoy five minutes of flight from charging it for 30 minutes. 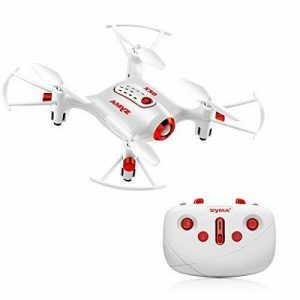 Offers 360° roll-over button and one-key return, the drone can auto locate the remote control, just press the one key return button and the drone will fly back to the remote control’s location. The package includes the Eachine E010 mini drone, transmitter, 3.7V 150MAH battery, four propellers, USB charging cable and a user manual. When looking to buy a mini drone, there are a couple things you may need and want to consider. Since choosing the best one for you amidst the many different models is not an easy task. A particular model with few considerations should provide you a great reason to purchase it. For many people, the budget is a very significant factor when it comes to product purchasing. However, it doesn’t mean that you should only buy a very cheap unit you can find. You must also consider how worthy the drone is. One suggestion is that if you still don’t have that much experience and knowledge in flying drones, we recommend to get a cheaper and small one for practicing to master the basics. An extremely affordable model will be perfect to have you familiarize with different situations that may damage your drone. You surely would not fancy to damage an expensive one during trials and practices. So, go for the very affordable models for starters. By the time you have enough experience in flying, you can then spend on a much pricey and more developed unit. Typically, smaller drones can fly from 5 to 10 minutes, and its control distance can reach up to a hundred meters. Some brands do state an extended flying time plus better control distance than they can truly offer, so it’s always a good idea to read reviews for the true and honest deal. In addition to the duration of length of flight time, it’s also nice to own a mini drone with remarkable flight stability and various flying modes. Never rush in buying a drone just because they are super cheap or just cool-looking. It is ideal that you observe the motors and its features, memory capacity, structure, and battery capacity. 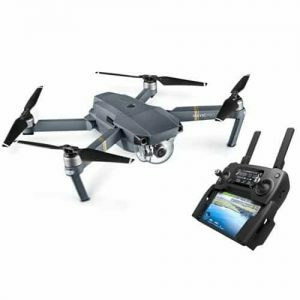 You should also make sure if a certain drone can be upgraded and installed with some additional accessories and applications such as camcorder, lens, and others. We all know that flying a mini drone is very enjoyable. But, it’s more fascinating if you will also use your drone for photography and video capturing. Therefore, the camera is also one fact that you may need to consider. Not all mini helicopters come with built-in cameras in their build. Some cameras record videos from the remote control or directly to a screen, tablet or smartphone, while the others shoot footage and save directly to microSD cards and other storage. That is another feature to consider. Apart from the technicalities, the design and materials used are also important considerations when buying a mini drone. The design basically relies on the colors, frames, and structure. It is a fact that brands strive with an objective to produce good-looking and attractive models, but not all mini drones are equally attractive for customers. When it comes to choosing your mini drone, make sure that you have chosen one with a design that you like. Also, you might want to observe the material of the frame. If you’re not an experienced remote control pilot, it will be better to choose those metal ones, since it is a lot more durable and can survive most crashes. The plastic models are usually very affordable, but are very likely to be broken or damaged easily. The most beneficial feature of mini drones is their affordability. When it comes to mini drones, you can easily get one with great characteristics for a cheap price. Some of them are available for only around 20 dollars. Mini drones are also more likely to be bought easily since sellers can easily keep them in stock because of their smaller size. And since they are a lot smaller too, you pay a lesser amount of shipping fee when you choose to buy online. This makes it one of the easiest and best drone type to have. Mini drones tend to be more simple in design and controls. Since they are a lot smaller they are not equipped with many complicated buttons and joysticks. They are the easiest to maneuver because of its simplicity and straightforward instructions, commands, and controls. And since they are compact and lightweight, flying them will not be a challenge. If ever you are still not confident with your flying skills, worry not since you can fly these tiny aircrafts indoors. The simplicity of mini drones and their remote controls makes them very easy to maneuver and control. As mentioned above, drones are simple enough to be controlled and maneuvered with ease. Because if it’s easy operation, mini drones makes good practice drones. Beginners often choose to fly mini drones to be able to develop their flying skills. And since mini drones do not have destructive crashes, novice flyers can practice all day without the fear of instant damage during a single crash. And for those who do not want to risk crashing into trees or other people, mini drones are super safe to be used indoors. When it comes to flexibility, mini drones come in first among the line of the different drone sizes. They are flexible in the sense that they have a multitude of functions and you can use them for very many reasons, as discussed below. The primary reason for getting a mini drone is definitely for fun. Mini drones are also great for recording and capturing important moments. In addition to that, mini drones can easily fit through small passages, making them great for surveillance use and security purposes. Drones have been famous to easily catch and capture ongoing acts like no other. Good examples are capturing a bride walking down the aisle on weddings, fun and games during birthday parties, and thrilling situations during sports events. Mini drones with good cameras are also useful during seminars and speeches on important events. Some mini drones come with live casting mechanism while taking a video in the wild. These modes and features are ideal for those who like watching nature and spotting animals in the national park. These drones are also used professionally by veterinarians or safari workers. Using a drone ensures quite stunning shots of good quality while capturing wild animals’ natural movement and interaction. Mini drones have been used by military and different armed forces to safely secure perimeters. They are also used to investigate and track certain people and vehicles in a certain area. Mini drones are also effective for military surveillance because of their small nature. The drones have a very small structure that allows them to fly into very small spaces undetected. For this reason, they are used for surveillance and covert operations especially by the military and other intelligence professionals. In relation to the above-mentioned, mini drones can help the army in looking around for the vulnerable area for spotting threats, through their sparrow size design. The mini and smaller models despite the size are unbelievably sturdy to perform even in remote areas while remaining unnoticed. Drones are ideal for taking a bird’s eye view of the many things on land and even on water from an aerial perspective and then fly close to confirm what it is. 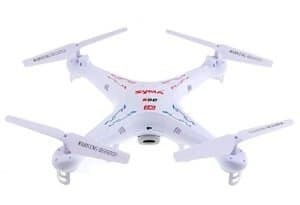 Such ability is ideal for reviewing properties and other different places You can also use a mini drone to monitor the health of plants and crops in the nearby lawn or field, respectively. These are the activities wherein miniature spy drones are handy. Mini drones can be used to take up delivery tasks. They are functional enough to carry medicines or other significant small items. This will be very helpful to those who cannot move or come out of their homes. Mini drones can also efficiently deliver letters similar to birds during the olden times. Mini drones are totally cool! Nano and mini drones take all the fun that drones bring and put them into a smaller amount of packaging. They are totally cute, brings loads of fun, complete with features, and come with many surprises. They are also loved by most people because of its affordable price, portability, easy to use, and minute structure. But still, some people tend to overlook the mini drones because they’re so tiny. Some may think that they lack great features. 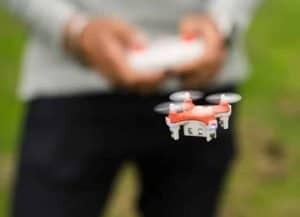 But we hope at the end of this post, if you are one of those people, you ’ve already had a change of heart when it comes to these mini drones. Mini and nano drones are awesome in their own little ways. Some of them have features that are larger than life, while others remain as simple as possible to focus on the RC flight experience. Either way, mini drones are totally lovable and admirable.